There are certain things in your life that take on a greater significance as the years go on, even if at first you couldn’t possibly see it. Today is Halloween and over the last couple of weeks we’ve brought you 13 DAYS OF HALLOWEEN: A BEN COOPER A DAY, celebrating the awesomely kitschy costumes of decades past. Cartoonist Chris Ecker of Knight Watchman provided most of the pix — and one of them jumped out at me as I perused his collection. 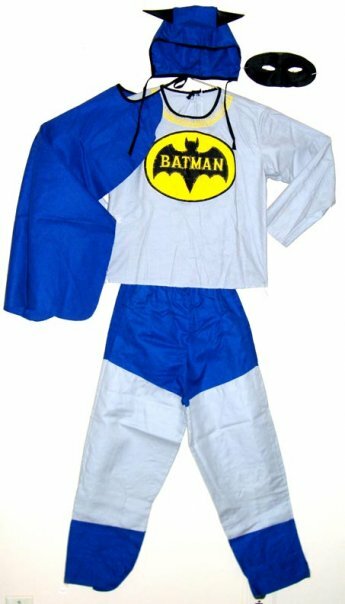 A cloth Batman costume from the late ’60s/early ’70s. 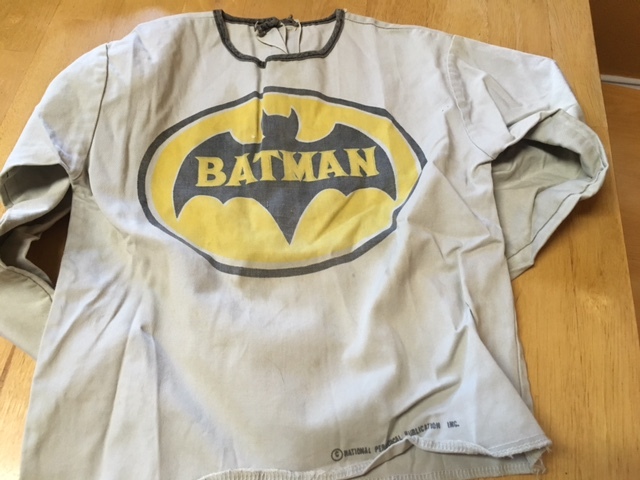 I had one just like this and all that survives is the shirt, which is in excellent shape, I’m happy to say. 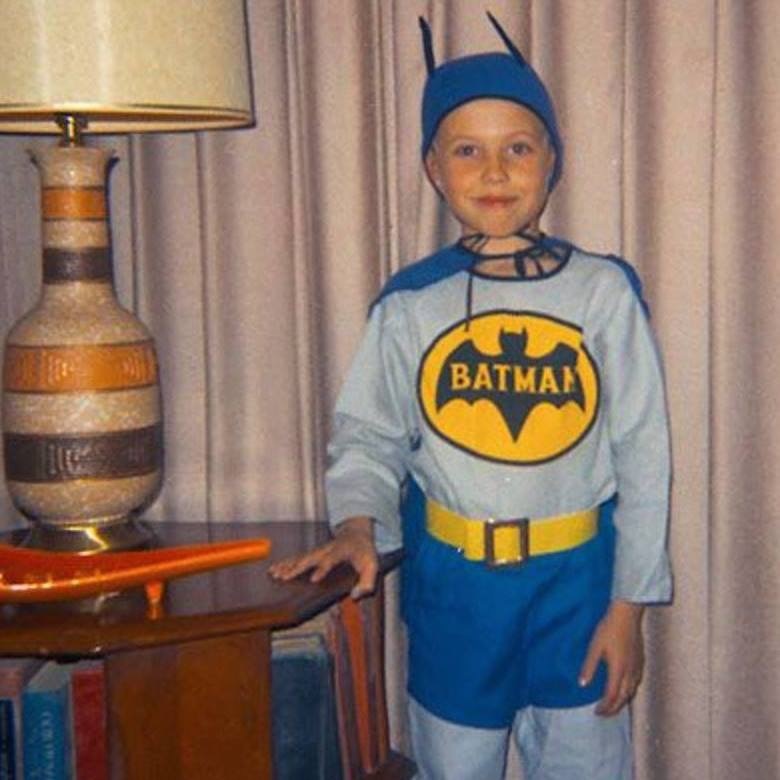 Obsessed as I was with all things Batman — especially the Adam West TV show — I lived in this costume from, say, 5 years old until it no longer fit. This was not a Halloween costume to me. 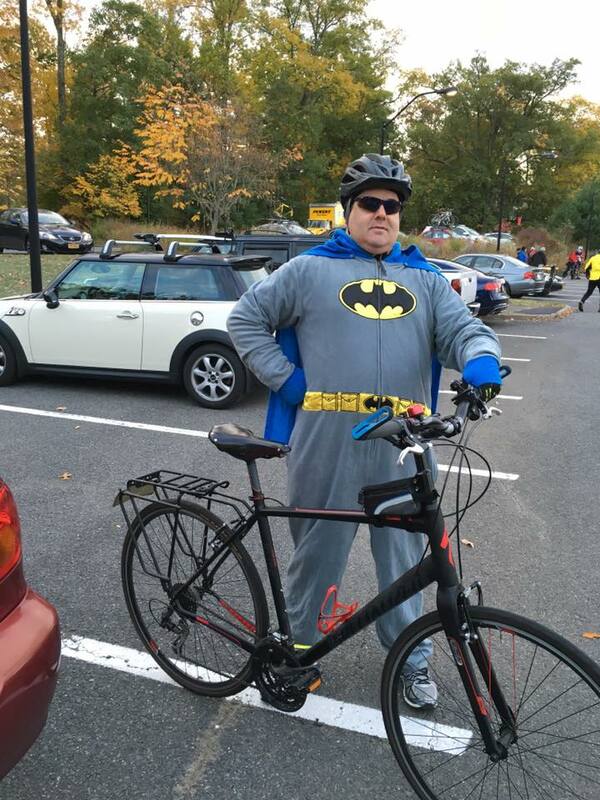 This was a Batman costume and I wore it as often as I could. For me, the first thing to disappear were the pants — they got torn pretty quickly. I improvised by taking a pair of dark blue slacks and putting on a pair of tighty-whities over them. (I wasn’t too troubled by the inversion of hues.) I added a pair of black rubber boots. The belt vanished too at some point, replaced by a leather one. For gloves, I added a pair of brown leather numbers. I used to chew on the tips until my mother warned me I’d get “leatheritis” if I continued. The cape lasted, though the hood and facemask disappeared. I was pretty careful with my stuff but I wore this thing so often that it’s no surprise that parts of it would vanish or wear out. I had to live with that bat on the forehead but the paint eventually wore off so it wasn’t quite so noticeable. And, amazingly enough, I was able to track one down from a Mexican seller on eBay not long ago. Great price, too. That’s the one in the picture above. Eventually, I grew older and had a family of my own. 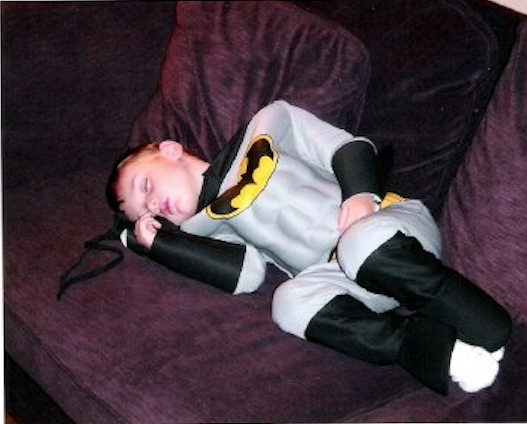 By the time my son, Sam, was a toddler, Ben Cooper had vanished. No, I didn’t pose him like that. These days, I make do with a Batman T-shirt or three and that’s fine. I still get a thrill whenever I put one on. 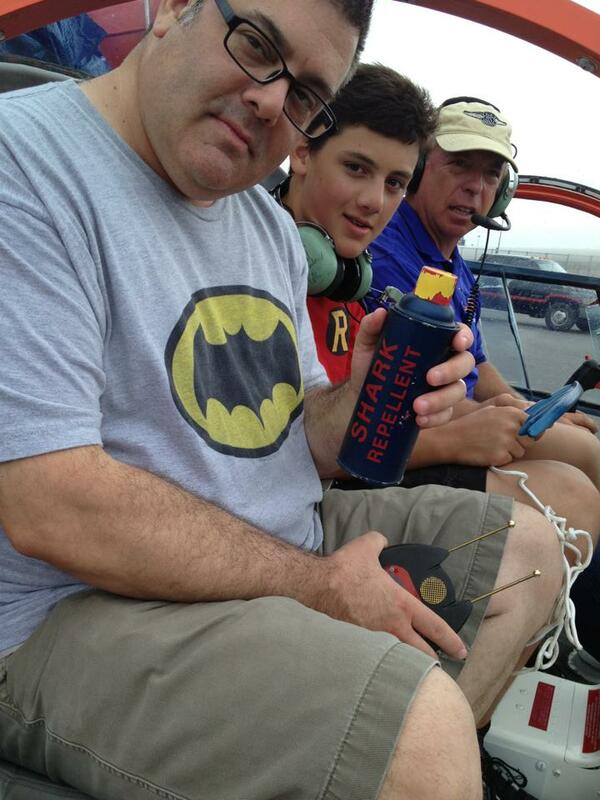 Me, Sam and Capt. Eugene Nock in the cockpit of the original Batcopter. This was a few years ago. Not the most flattering picture, but you gotta give it all for art, amirite? Anyway, last weekend, I put one of my T-shirts on for a Halloween party at a friend’s house. I added a cape I’d picked up at some point and a collectible Adam West-style cowl. I didn’t really match but I didn’t care. It was a last-minute decision, for a laugh. Off I went with my wife, Wendy. Sam had to stay at the house because he had things he needed to do. Only this time it was the truth. — BEHIND THE PLASTIC MASK: When BEN COOPER Ruled Halloween. Click here. — The Goofy Giddiness of Disney’s CHILLING, THRILLING HAUNTED HOUSE Record. Click here. Did you ever see the Ben Cooper Batman Mego figure made by Anthony Dulso, complete with Ben Cooper style Box – now that would be a great item to remind you of your childhood! As much as I enjoy all your work, this was the single best post you have ever done. Sharing your childhood experience, with photos, vividly demonstrates the civilizing ethos of the comics hobby. 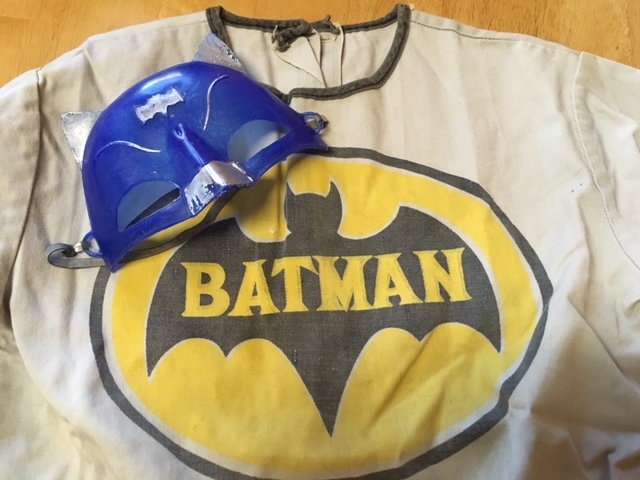 I never had a Batman costume, but DC heroes, including Batman were very important in shaping my literary and ethical sensibilities, and that is an important memory. Wow, Alan, thank you. I’m truly moved. All the best to you. 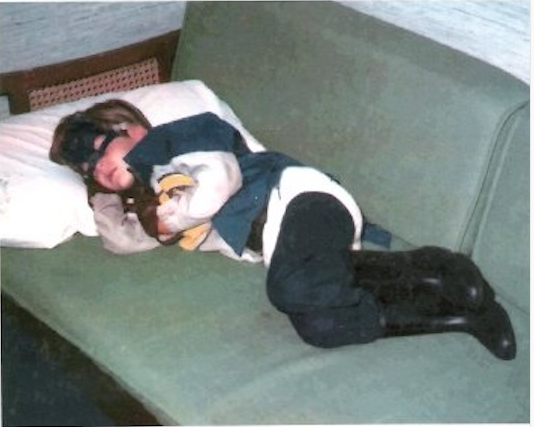 I still have my childhood Bat-suit (just like Rob’s pictured) but the mask is long gone. About 10 years ago, a very similar Batman mask appeared in a Bat-themed Easter basket. It looks to be from the same mold. 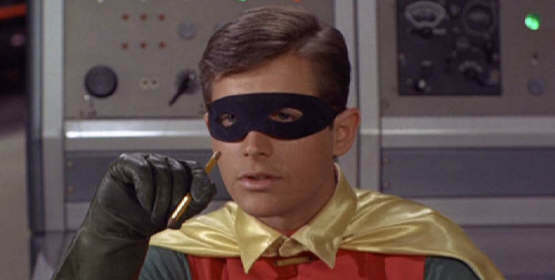 I love that Adam West-like Mexican half-mask! I’d never seen that before. Thanks for sharing your memories, and the great pics! Love this post! Great costumes and photos! 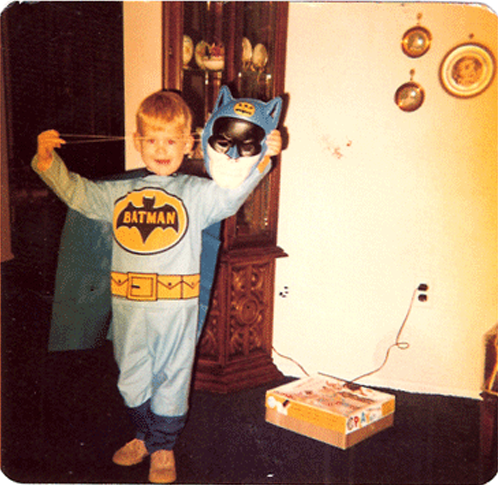 Takes me back to my own Batman costumes both store bought and homemade for my Super 8 Batman movies as a kid.